Perfect macros don't go wrong, and don't need error-handling? Sadly, not true - this blog explains how error-handling works in VBA, with examples. This is the template for virtually every error-handling routine: set an error trap, designate where you should go if it's triggered, and exit the subroutine if if isn't. 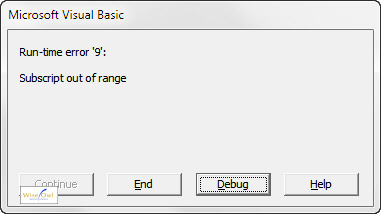 A label in VBA ends with a colon or : and denotes a place you can jump to. Like most things in VBA, a label can't contain spaces, and should be written in CamelCase (that is, with each word capitalised). The subscript is out of range because there is no object in the collection of worksheets called TestSheet. On Error GoTo SomeLabel If an error happens, jump to the given label. On Error Resume Next If an error happens, ignore it and go on to the next statement. On Error GoTo 0 Revert to the default error-handling (ie displaying a system error message). The code would sign cell A1 in whatever the current worksheet happened to be. I would avoid On Error Resume Next - it's just asking for trouble! 'error from now on is genuine! to make sure that if an error occurs which I hadn't foreseen, it doesn't display a misleading error message. Now that we've looked at a typical basic error-handling routine, it's time to look at other options you have within error-handling segments of code.